Welcome to Classical MileEnd Alpacas run by Chas Brooke and Rachel Hebditch. We are delighted to announce that Houghton Placido, Champion White Male at the British Alpaca Society National Show 2019, will be joining our team of stud males this summer and will be available for a limited number of matings. Placido has a strong frame, excellent bone and a broad chest, all requirements for a working herd sire. His phenotype displays a lovely soft handing fleece with desirable staple length, excellent uniformity of micron extending well into the shoulder, the rump and belly. He has an impressive low micron ratio between primary and secondary fibres contributing to his fleece handle. Coming from the proven Jolimont Rodrigo 2 line, his longevity of fineness with age, will compliment and extend our existing breeding goals to produce long staple and soft handling fleeces for many years. This male represents a new blood line for us. His sire is Bozedown Escapade and his grandsire Jolimont Rodrigo 2 who maintained his fineness to a great age. Rodrigo is also the sire of Bozedown Ascendant whose progeny group won at the BAS National Show twice in a row. Placido’s dam is Houghton Perdita, first White Senior Female at the BAS National and Showtime in 2014 and the dam of Houghton Perry who has been awarded a string of broad ribbons. We have around 100 alpacas on our farm in Devon and have been breeding alpacas for more than 20 years. Aside from breeding the best alpacas we can, we have an online magazine Alpaca World magazine and an alpaca yarn business UK Alpaca so plenty to keep us busy. We have alpacas for sale, mostly fawns and whites, pregnant females, pet boys, stud males to suit all budgets and are very happy to offer on farm husbandry training and advice to all our clients. 2018 brought us aome excellent show results with CME Dion awarded Show Champion Huacaya at Devon County Show and our two white girls champion and reserve. Delighted by our results at the British Alpaca Society National Show 2018 too where 600 alpacas were shown. Appledene Commander in Chief was Reserve Champion Fawn Male. He is a senior now so very pleased with that. His daughter CME Leda was awarded the Reserve Champion White Female and another daughter CME Eugenia was first in an intermediate fawn female class. Following her was a CME Priam 11 daughter CME Agatha, third in the same class whilst another daughter CME Brigit was first in the junior fawn female class. Our little beige boy CME Ethan was first in his class whilst the whites didn’t do too badly either. There were five classes of junior white females and CME Carlotta was fourth in hers as was CME Orlando 11 and CME Dion. Services to Houghton Placido, Appledene Commander in Chief and CME Priam ll, CCNF Talon, CME Dion, CME Florestan are available in 2019. We were thrilled to be awarded the Fibre to Product award for our Posh Socks by Paul Whittey of Penrose Products who sponsor the Fibre Zone at the National Show. This year’s fleece collection will open in the spring if you would like to sell your fleece to us. Please go to www.ukalpaca.com for more details. Our range of alpaca POSH socks by UK Alpaca offers alpaca ribbed socks for everyday wear in town or country, lounge socks for padding about the house or for cosy toes in bed, that are all made from our own British yarns and knitted in Bradford. Of course, we also stock the ever popular walking sock, a performance sock that walkers love. All are available though the UK Alpaca webshop. We welcome enquiries from wholesale buyers. 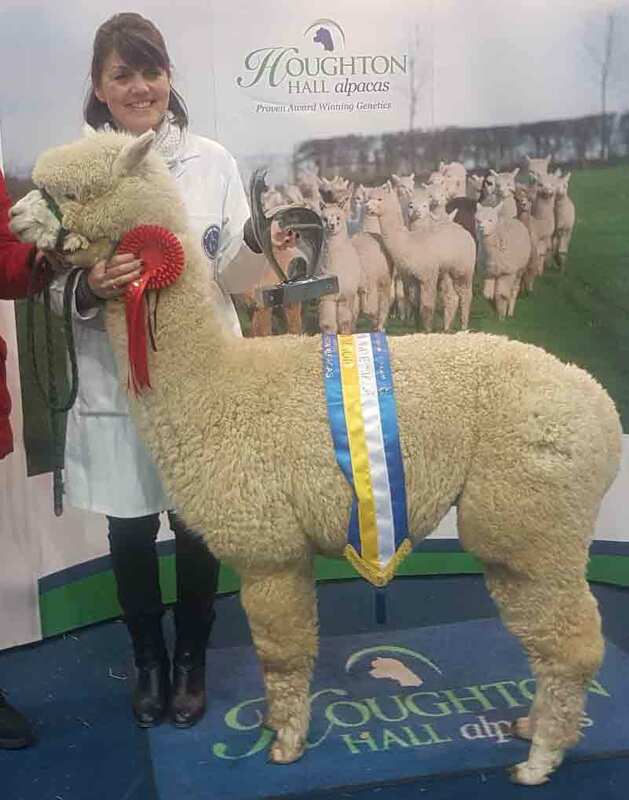 We have a wide range of alpacas for sale from show winning males and females, pregnant females with cria at foot and stud males to charming geldings who make wonderful field pets or sheep and flock guards. You are welcome to visit our farm, just outside Tiverton in Devon, where we can meet and answer your questions in person and show you our beautiful alpacas. Please e-mail or telephone to make an appointment. New owners can rely on us to train them in alpaca husbandry and deliver a first class back up service. Experienced breeders can be sure that we have thought carefully about every breeding and that our stud males are among the best in the world. We publish the online Alpaca World magazine, check it out at www.alpacaworldmagazine.com, for great editorial content and the latest news from Europe, the UK and the rest of the world. Updated every month and accessible via your smartphone or tablet, Alpaca World will keep you in the loop on the latest genetic, scientific and veterinary advances in the care of alpacas and subscriptions are free on the website. and our alpacas are registered with the British Alpaca Society Registry.